Pooley Bridge sits proudly as the northernmost village on Ullswater, in the Lake District. Ullswater is often referred to as England’s most beautiful lake and is the second largest. The bustling village of Pooley Bridge is the gateway to the picturesque north and western Lake District and is easily accessible from the M6. You are in very good company staying in a holiday cottage in Pooley Bridge and the Ullswater area. Much of the land along Ullswater shore is privately owned and several grand historical properties are dotted around the region. Lakelovers have an impressive collection of luxury cottages in the Pooley Bridge area. All of our properties are VisitEngland 3 to 5 star rated and Lakelovers have the largest collection of Gold Award properties in the Lake District. We offer the most desirable properties in the area, including grand estates with acres of private grounds, stylish conversions of conveniently located one bed cottages and luxuriously renovated detached rural retreats. Step inside one of our holiday cottages in Pooley Bridge and you’ll be greeted with some serious ‘wow factor’, from designer kitchens, sumptuous bedrooms and luxurious bathrooms to state of the art entertainment systems and unique style, complementing traditional Cumbrian features so you always never far from the beauty of the Lake District. Enjoy Cumbrian ales and al fresco dining on your own terraces, taking in ‘million dollar’ views and relax in private gardens, enjoying the local wildlife. For cosy evenings, snuggle up next to a wood burning fire with some local cheeses and wine. Enjoy entertaining in a stylish setting, with all mod cons to hand and traditional features like slate flooring and wooden beams giving you a real feel of the Lake District. The Lake District is an ideal holiday for dog lovers and with Lakelovers pets holiday for free. We have lots of dog friendly properties in Pooley Bridge and the Ullswater area so you and all the family can enjoy this special part of the Lake District. 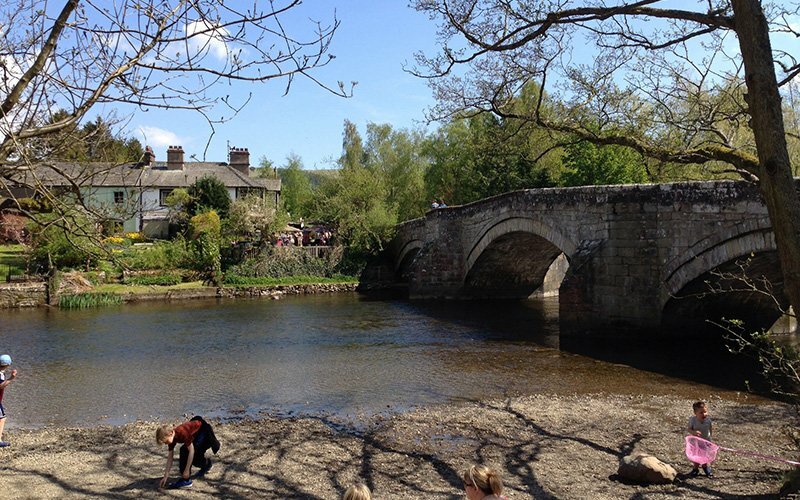 Pooley Bridge was once a busy market town, but today a superb holiday atmosphere welcomes tourists. Cafe seating spills onto the main thoroughfare, dotted with shops and eateries selling brightly coloured kids fishing nets and tempting ice creams. In the 19th Century nearby Penrith took over presidency of being the main local market town and today Penrith, a 15 minute drive along the A592 from Pooley Bridge, is still a hub of shops, pubs and restaurants selling fantastic local produce, and making self-catering in Pooley Bridge easy. At only 6 miles in the car from Junction 40 on the M6, Pooley Bridge is extremely easy to get to, yet at the same time offers you the seclusion that you want from a countryside retreat. Following a train journey into Penrith train station, where the Westcoast mainline connects London and Glasgow with the east Lake District, a 15 minute bus, car hire or taxi ride will bring you into Pooley Bridge. Ullswater ‘Steamers’ have a pier at Pooley Bridge, so it really is ideally located to enjoy the Ullswater area. Hop on and off ‘Steamers’ between Pooley Bridge, Glenridding, Howtown and Aira Force and enjoy all or parts of the new 20-mile ‘Ullswater Way’. Once bags are dropped off and before the fridge has even been filled, heading to the shores of Ullswater is a must. Whether it is an evening stroll along the shore – stone skimming, kite flying, paddling – a morning dog walk and dip, or heading out across the lake, throughout the seasons, Ullswater is stunning. In fact, Ullswater itself has been compared to Lake Lucerne in Switzerland. It is hard not to exclaim about the beauty of Ullswater, with the gentle hills and ancient woods of the north and dramatic peaks towering over southern Ullswater. Much of the shoreline of Ullswater is privately owned which is why exploring on the water itself is recommended to fully enjoy the beauty of this area. Sailing, rowing, canoeing, motor cruising, kayaking and windsurfing are enjoyed on the lake, along with wildlife spotting, fishing and wild swimming. Pooley Bridge is a real hub of watersports and you’ll often see groups of school kids taking on raft building challenges and Kayak capsizing drills. For everyday exploring of the area, whether on foot (two or four!) or cycling, ‘Ullswater Steamers’ is a must-do attraction, whilst staying in self-catering cottages in Pooley Bridge. The long ribbon lake of Ullswater is the second largest of the Lake District’s waters. It’s mountain reflections, pebbly beaches, clear waters and grand mountain surroundings make it a very popular holiday destination and has attracted tourists since the mid 18th Century. In fact, Wordsworth once wrote; “Ullswater, as being, perhaps, upon the whole, the happiest combination of beauty and grandeur, which any of the Lakes affords”. Energetic walkers are attracted to Pooley Bridge and the Ullswater region to take on some of the must-do hikes in the Lake District, like Helvellyn and Striding Edge. If scaling one of these peaks is not your bag, but you’d like to get up high to enjoy some views then the short walk up Aira Force waterfall quickly gets you to an elevated position where you can take in the vast lake and surrounding jagged peaks in all their glory. Past Aira Force, in the car, carry on along the windy A592 to the infamous Kirkstone Pass, the loftiest in the Lakes at 1,489ft, and you are rewarded with spectacular views. This drops you down into the popular Lake District holiday town of Ambleside which sits on the north shore of the the largest lake in England, Windermere. Pooley Bridge is ideally located for a self-catering holiday. There’s Penrith only 15 minutes away, with more supermarkets than surely warrants its market town size, but perhaps reflects the popularity and foodie nature of the area. Take your pick including Booths, Sainsbury’s and Morrisons, all open from early in the morning until late evening. To experience the thriving artisan food scene in Penrith a trip to Cranstons Cumbrian Food Hall is a must. We guarantee you will want to return! Often Lakelovers holidaymakers are heading to Pooley Bridge and the shores of Ullswater for a special occasion or celebration, so picking up some fresh, local produce is a perfect way to deliver a meal with verve. There’s are lots of events in the Pooley Bridge area where you can stock up your holiday cottage kitchen cupboards. Dalemain Estate is less than 3 miles away and is host to a varied calendar of foodie events, including the Great British Food Festival over the August Bank Holiday, where you’ll find lots of artisan makers. The mansion and sprawling historic gardens and woodland is also a great way to while away a relaxing afternoon. A 10 minute drive away, Rheged Centre, with an ever changing annual calendar of Cumbrian events, from art and photography exhibitions, fairs and festivals, live cookery performances, in-house film premiers and seasonal events like their fantastic Christmas Helter Skelter, is certainly worth a visit. They also have a great range of independent shops, several cafes and a gastro restaurant. There’s always kids activities on, as well as a small soft play area and for the crafty there’s pottery painting. Take some local delicacies back to enjoy in your holiday cottage from their specialist Cumbrian Foodhall. You won’t find many food miles here and the delicious food will fuel many a good walker! If you’re heading on the M6 south towards Kendal and the south Lake District, or perhaps arriving from the south, then you’ll find worse places for a toilet stop than Tebay motorway services, just outside Penrith. It has been described by Which? Holiday magazine as ‘the closest the motorway network comes to Harrods Food Hall’. It is excellent for great local produce from their Farm Shop, which is a first for British motorway services. You can even pre-order so that you can pick up some freshly baked sourdough from award winning local artisan bakery More? of Staveley, farmhouse cheeses, and traditional ‘nose to tail’ butchery, including the famous Cumberland Sausage recipe. Break up a family car journey with a walk around their duck pond and dog owners will enjoy the specially planned dog walk! When on holiday eating out is a luxury that you have time to enjoy and there is plenty to choose from when staying in Pooley Bridge. Closer to Penrith you have Yanwath Gate, a pub serving excellent food with a warm welcome to match. The Punchbowl Inn at Askham, considered by Alfred Wainwright as one of the prettiest villages in the old county of Wesmorland, certainly deserves its rave reviews and popularity. This delightful village even has an open air swimming pool, which includes a heated paddling pool for little ones, perfect for a warm summer’s day. For garden lovers, Askham Hall Gardens and the newly renovated Lowther Castle gardens are superb and can be enjoyed time and again, especially as the seasons change. Lowther Castle’s refurbished coach house cafe serves warming hot dishes, perfect for after an Autumn walk, as well as light, cold snacks, hot drinks and cakes of which we’d recommend the scones! A good pint next to a comforting fire is a memory many enjoy when visiting the Lake District, and The Queens Head Inn in Tirril, less than 3 miles from Pooley Bridge is a great place for enjoying just that. They have their own brewery and you can also enjoy the beautiful pub building, once owned by William Wordsworth’s brother. Families staying in Pooley Bridge should include a trip to the Sun Inn which has a superb garden and play area which has plenty of enclosed space and a wooden play fort to keep kids entertained whilst parents enjoy a relaxing drink in the peaceful surroundings. The pub is also dog friendly and the outside space is ideal for muddy paws. For a meal off from cooking, they all offer an excellent gastro menu including a tasty little people’s menu. If it is a luxury holiday in the Lake District you’re looking for, you will find it with Lakelovers Pooley Bridge cottages. Views of sublime scenery in enviable locations, our properties are hand-picked for their location. Close to fine dining eateries, leisure facilities, afternoon tea, champagne lunches and beauty and spa treatments. In fact, why not look for a Lakelovers cottage with your very own hot tub or even book an in-cottage beauty treatment. Our holiday cottages in Pooley Bridge are presented to the highest standards, with stylish refurbishments and romantic rustic retreats, couples walking boltholes, large cottages for celebrating special occasions. Other nearby locations that provide the perfect base for exploring the north Lake District includes Ullswater and Keswick.